The Best Friend Project’s Peace Campaign commenced in 2006 with a 29-day peace march from Cologne to Berlin led by Ashin Sopaka. Since then, similar walks have been led from New York to Washington, D.C. and from Bangkok to Mae Sot. Sleeping in temples, churches, and homeless shelters along the way, the participants demonstrate their dedication and eagerness to work for peace. More importantly, they are able to share their message not only with those they meet along the way, but also with a broader audience via the media. In the four years since it began, the Peace Campaign has evolved into much more than peace walks. 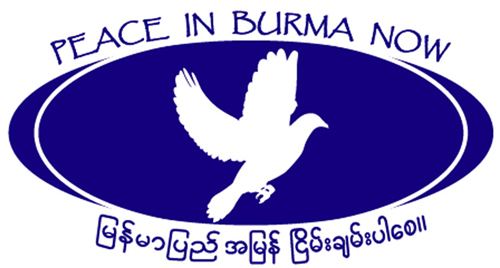 From The Best Friend’s home in Mae Sot, the campaign also involves the distribution of ‘peace dove’ clocks, flags, and t-shirts to schools and businesses, and the spreading of more than 10,000 ‘peace stickers’—with the campaigns’ message of “Peace in Burma Now” in both English and Burmese—throughout the community. Recently, several Western volunteers have been able to stealthily post the stickers inside several towns in Burma, reminding Burmese people with hope and optimism that the struggle for peaceful change in Burma continues. Future plans for the Peace Campaign include a 2010 Peace Walk in Mae Sot with speakers and activities, as well as a series of educational forums and workshops about the value of peace and ways of attaining it. These events will be multi-lingual to ensure as broad a spectrum of people as possible not only recognize and willingly display the ‘peace dove’ image, but also develop a deeper understanding of the importance of peacefulness.